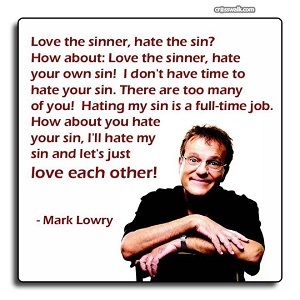 A graphic recently came up on facebook with a quote from Christian comedian Mark Lowry. Since it’s hard to trust the truth of these things, I double checked and the quote is on Mark’s site. It’s certainly a nice, tolerant sentiment. But as I commented when I saw it on Facebook, it’s not a biblical or charitable sentiment. The war for our souls is indeed personal. The eternal revolution for the Kingdom of God is within each and every one of us. But at the same time, just as we should look to our own battle, we should not neglect our neighbors, our brothers and sisters. The quote is “hate THE sin.” Mr. Lowry’s error appears to be assigning ownership of the sin. “Your sin,” “my sin.” Sin is an act of will that cuts us off from God. To jump to an extreme, if one person murders someone, murder is the sin. It doesn’t become “his sin.” It’s an act he committed. His act, but still the sin of murder. The expression “There’s so many of you” belies this sentiment; there are many of us, but comparatively very few sins. So if you hate the sin that you commit, don’t neglect to loathe it because it is destroying the eternal life of someone else. And that’s just from that nice fellow Jesus in the New Testament. When we go back to the Old Testement, God clearly instructs the prophets that they will be accountable for not guiding others. (Ezekiel 3:18, for instance). It is certainly not charitable to tell people that God hates them (which is a lie, Jesus died for everyone, a sacrifice of love). But it is also uncharitable to tell them that you don’t detest “their sin,” simply because it affects their soul and not yours. So love your neighbor as yourself, for God loves them as well as you. That includes not only the LGBT community, but the serial killers, the rapists, the murderers, the thieves, the prostitutes, the politicians, the child molesters, the pornographers, the dictators, the socialists, the capitalists, and even other Christians. Who ever said charity was easy or nice? No one in the Bible, that’s for certain. Neither did those ancient warriors, the samurai. “To give a person one’s opinion and correct his faults is an important thing. It is compassionate and comes first in matters of service. But the way of doing this is extremely difficult. To discover the good and bad points of a person is an easy thing, and to give an opinion concerning them is easy, too. For the most part, people think that they are being kind by saying things that others find distasteful or difficult to say. But if it is not received well, they think that there is nothing more to be done. This is completely worthless. It is the same as bringing shame to a person by slandering him. It is nothing more than getting it off one’s chest. To give a person an opinion one must first judge well whether that person is of the disposition to receive it or not. One must become close with him and make sure that he continually trusts one’s word. Approaching subjects that are dear to him, seek the best way to speak and to be well understood. Judge the occasion, and determine whether it is better by letter or at the time of leavetaking. Praise his good points and use every device to encourage him, perhaps by talking about one’s own faults without touching on his, but so that they will occur to him. Have him receive this in the way that a man would drink water when his throat is dry, and it will be an opinion that will correct faults. Now if a pagan warrior can show this much compassion and charity but still counsel his brother about “his” sin, how can you as a Christian do any less? Certainly not by condemning and damming a person, but neither by dismissing someone else’s sin as their own problem and reserving all judgement. Hey, it’s not called the narrow way for nothing. This post originally appeared in an earlier incarnation of the Eternal Revolution blog.